Description : Our manufactured Peg measure products range consist of Stainless Steel Jiggers. They are superior in quality and are easy to clean and maintain. Crafted out of finest quality steel, these impart a shiny finish and are high in functional value and utility. Enriched by our vast industrial experience in this business, we are involved in offering an enormous quality range of Wine Bucket Stand. Weoffer an exclusive collection of stainless steel bar supplies. Elegantlydesigned, these bar supplies are used for storing ice-cubes, in order toprevent them from melting. Made of stainless steel and economically priced, theseare available in various sizes and shapes. Enhance your evening presentation with these stainless steel bar accessories. These pieces are perfect for holidays and parties. Serve your favorite drink in these glasses and win the accolades of your near and dear ones. 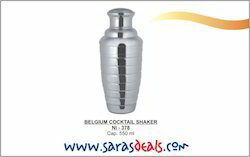 - Ice bucket - Cocktail shaker - Champing bucket - Wine bucket - Measuring cup - Measuring spoon. We are leading manufacturers & Exporters of quality Stainless Steel Utensils & Fancy Novelties Serving Tray and Specialist in Compartment Serving Tray based in Mumbai and have a presence in global market like UAE, Muscat, Republic of Yemen and Oman. Promo Bucket, Hotels and restaurants want to make sure their ice Bucket , champagne or wine is served in the classiest contained possible. The Stainless Steel Promos has a mirrored finish exterior that will impress any guest ordering room service.